"Unless we fully give ourselves over to our endeavors, we are hollow, superficial people and we never develop our natural gifts. We’ve all known people who, like monkeys, mimic whatever seems novel and flashy at the moment. But then their enthusiasm and efforts wane; they drop their projects as soon as they become too familiar or demanding." Wing Chun/Ving Tsun mastery or even just proficiency is simply a matter of sticking with it and doing the right things that will lead to mastery. If mastery seems too much as a goal for now, then aim for proficiency... after you reach proficiency, then you can go for mastery. But whatever you do don't be a monkey. And don't copy monkeys or whatever you happen to find on places like YouTube. Ip Chun... Ip Man's son. This is very rare video footage that you can review over and over again until you become proficient and then gain mastery. Wooden Man form (2 angles), Wing Chun history, the air dummy, techniques from the dummy, Chi Sao, Sil Lum Tao, Chum Kiu, and Biu Jee, Ip Man 8mm Footage of Sil Lum Tao, Ip Man 8mm Footage of Chum Kiu. 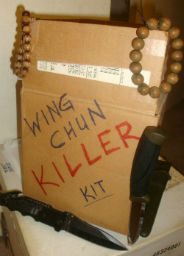 This DVD is a re-release of one of the earliest Wing Chun videos, Original Wing Chun. Watch as Grandmaster Ip (Yip) Chun does all three empty hand forms and then explains the applications, Chi Sau, and Lap Sau drills. One of the earliest Wing Chun videos anywhere! Yip Man demonstrates Sil Lum Tao and Chun Kiu. Yip Chun does all 3 forms. Yip Chun and Samuel Kwok do applications, Chi Sao, Lap drill and more. An ancient story tells how, three hundred years ago, a nun fled from the destruction of the Shaolin Temple and brought the world a method of unarmed combat par excellence. This previously secret art is now the most widely practiced Kung Fu system throughout the world. Ip Chun is the son of Ip Man - Bruce Lee's instructor. In this program, the Grandmaster performs the two forms against the Wooden Dummy then the forms solo, and finally the applications.